Bjorn Ranheim of The 442s warms up while awaiting a collaborator. 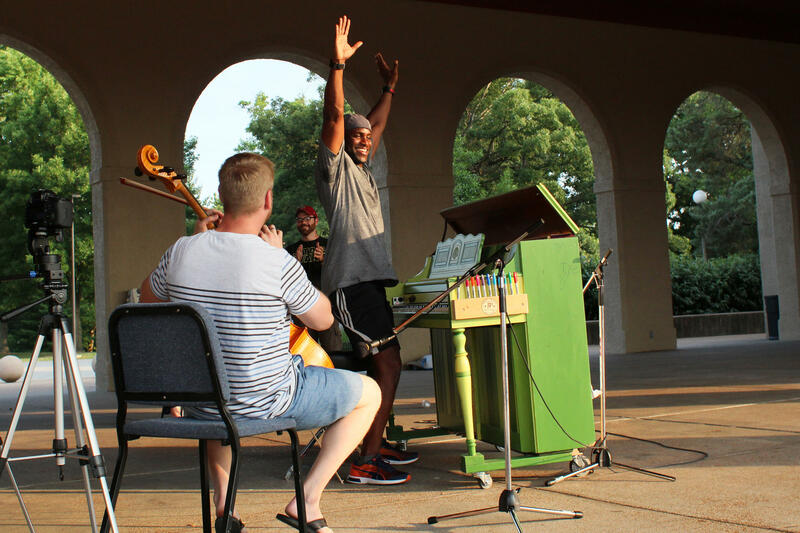 When 15-year-old Caroline Luethy saw a lime-green piano in Forest Park, she was immediately taken by the chance to play in a lush setting. Luethy, of Groton, Conn., approached the piano with a mix of anxiety and excitement. She sat down and started to improvise with chords, evoking a somber moment, like that of a movie soundtrack. 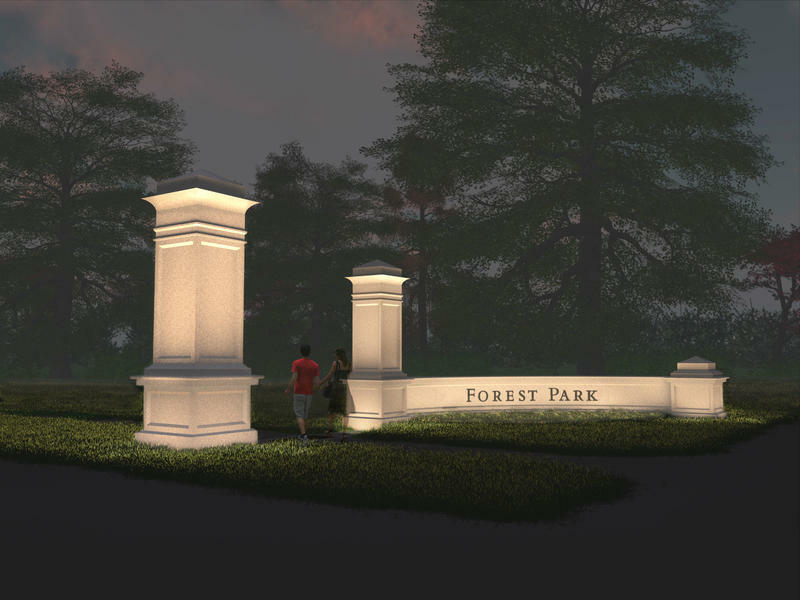 By doing so, she became a small part of an artist residency program launched this spring to celebrate Forest Park Forever’s 30th anniversary. 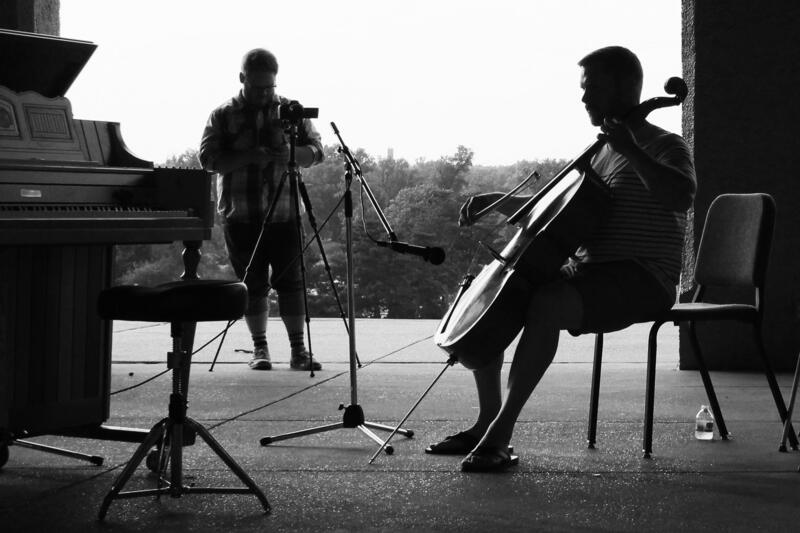 Within a few bars, Bjorn Ranheim, a cellist for the St. Louis Symphony joined Luethy at the World’s Fair Pavilion in the park. Throughout the performance Ranheim, also a member of the classical folk and fusion group the 442s, teased Elvis Presley’s “Can't Help Falling In Love.” When they finished their duet, most in the watching crowd of a dozen people gave them a standing ovation. Listen to The 442s collaborate with members of the public on a near 100 degree day. For Ranheim, that was a clear sign that members of the 442s were striking a public chord with their residency effort, which asks passers-by to play along with individual members of the group. “We do these projects for the hope that we can create something new and exciting, that sometime of collaboration will happen that is not possible in any other realm,” he said. The ensemble’s project is one of three selected by a jury to take part in the residency program this summer. Visual artist Madeline Marak will seek volunteers to place metal frames in under-appreciated areas of the park to highlight them. Collaborative artist duo Work/Play worked with the park’s horticulturists to collect plant matter for dyes to be used in visual art. All of the artists embraced the collaborative possibilities of the residency. “I feel like true collaboration is when you really do experiment and you do play and that’s when you get these really unique things, a product that comes from it,” said Kevin McCoy of Work/Play. Guided by David Rowan, one of the park’s lead horticulturists; McCoy and his wife, Danielle, harvested flowers and other plants from the surrounding area to create dye. Kevin and Danielle McCoy produced a limited-release book 'Live and Let Dye' using Jen Everett's photography documenting their residency. Rowan’s materials and direction helped them determine when to collect the plants so they wouldn’t harm the park’s ecosystem. After applying the plant-based dyes to canvas, the McCoys made a quilt that represents a map of the park. It includes details on where they gathered the plants. The 442’s used their residency to capture the musical imaginations of passers-by, soliciting performance gems from strangers. The group moved a piano to five locations throughout the park and asked people, regardless of musical ability, to play anything. Different band members accompanied the participants. After this fitness trainer finished leading a class nearby he came over to the piano and played a couple minutes with Ranheim. The process was filmed and recorded. Maness plans to use the footage for a film that will be screened in September, when the 442s perform compositions written this summer. Marak’s residency will take place in September. She will be creating a series of metal frames for volunteers to place in locations they view as ignored or underused. Marak hopes to draw attention to those settings and various resources as a way of expanding people’s view of the park. Marak draws attention to these spaces in her regular art practice, usually focusing on urban environments. The artist sees her residency as an extension of this approach. “Taking the time to stop and acknowledge these spaces, whether they be an empty lot, the area of grass beside your carport, or weeds growing out of broken sidewalk grows a greater awareness of the value of green spaces and the value of being outside in our daily lives,” she said. For the four musicians who make up the 442s, Duke Ellington’s words (right) resonate. Of the quartet of musicians who make up the group, two — violinist Shawn Weil and cellist Bjorn Ranheim — are members of the St. Louis Symphony. The other two — pianist, multi-instrumentalist and composer Adam Maness and bassist Syd Rodway — are known for their work with vocalist Erin Bode. Maness and Rodway also have strong jazz backgrounds. 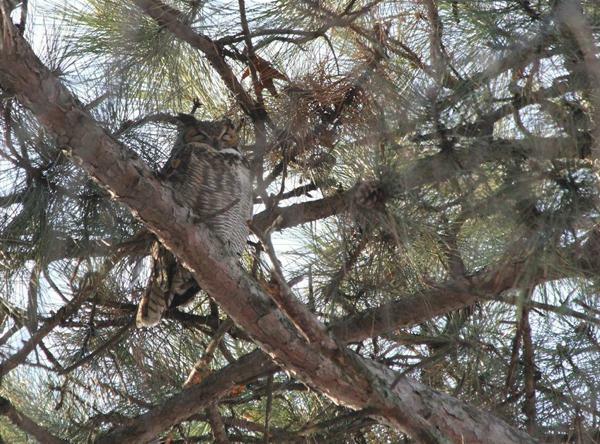 Although Great Horned Owls can be found just about everywhere in North America, they’re not the easiest birds to spot, even when you’re looking for them. Despite knowing there were Great Horned Owls in Forest Park and consistent exploration of the park’s wildlife, it took Mark Glenshaw years before he first saw one. Why? Almost 14 years ago a grand plan for elaborately designed ceremonial gates fell into an unceremonious heap.